The World's Most Advanced Live Production Switchers! Powerful 20 input 12G-SDI live production switcher for high frame rate HD and Ultra HD support, DVE, SuperSource, 4 media players, 6 keyers, 2 Ultra HD multi-viewers and more. Create stunning multi camera live production with the world's most advanced production switchers! 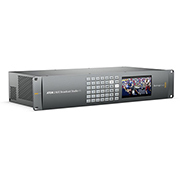 ATEM switches between SD, HD or Ultra HD video standards so you can form exciting live production with a wide range of video sources such as cameras, disk recorders and slide shows or animation from computers. You get powerful features such as chroma key, creative transitions, media pool, downstream keyers, audio mixer, multi view and more! The more advanced models include features such as up to 20 SDI inputs, SuperSource multi-layer engine, full motion DVE, stinger transitions, larger media pool with full motion clips and up to an incredible 6 auxiliary outputs! Innovative Design - Elegant machined metal design in a super compact size! Highest Quality Connections - Connect to SDI and HDMI equipment in SD, HD and Ultra HD! Multi View Monitoring - Use a single screen for all your monitoring! Creative Transitions - Get dozens of exciting effects and transitions! Digital Video Effects - Position, resize, rotate and scale in real time! Dual Media Players - Large graphics memory! Powerful Keyers - Exciting multi layer effects! Power Macros - The fastest way to set up and automatically trigger events! Amazing Ultra HD - Massive 3840 x 2160 video resolution! The world's first high frame rate Ultra HD switcher with 12G‑SDI! Remote Camera Control - Full camera control from your switcher! Professional Audio Mixer - Live mix multi channel audio from your cameras in real time! Independent Aux Output - Feed big screens on stage! Software Control Panel - Switcher control on Mac or PC! Professional Broadcast Panels - Add a hardware panel for fast professional switching! Extreme Reliability - Professional hardware based switcher for incredible reliability.